Meet your tour guide and begin your journey to Cairo. Once you arrive you will visit Sakkara with a stop at the Museum of Imhotep, a modern museum housing the treasures of the area. Also included in this stop is the Teti pyramid, the burial place of Egypt's first ruler of the 6th dynasty. Your next stop on your first day's journey are the Black and Red Pyramids. The Black Pyramid of pharaoh Amenemhat III who ruled from 1855 to 1808 BC. This pyramid is only one of three remaining of the original eleven that were constructed at Dashur. The Black Pyramid has collapsed on the exterior due to the elevation being close to sea level. The interior passages ways and rooms are still intact. The Red Pyramid located at Sakkara was the second pyramid to be built and is the third tallest every built, the only two taller are at Giza. 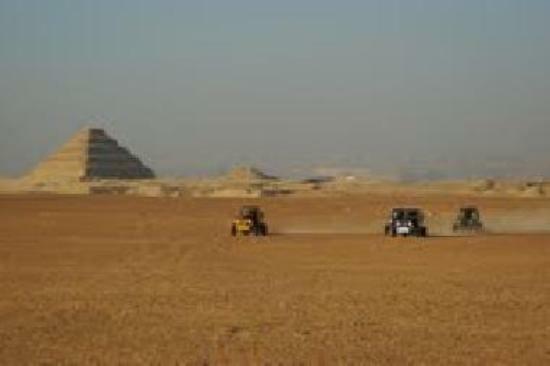 Then you meet the buggies and start self driving in the desert around the pyramids. What an exciting way to view the ancient wonders. These custom buggies are capable of whisking over the dunes at speeds over 50 mph. Lunch will be provided during the tour. There will be a sound and light show before transferring back to your chosen hotel. Day two begins with to Giza where you will view the pyramids and the Sphinx. The tallest of the pyramids reside at Giza. The region of Giza is one of the largest burial grounds in Egypt and it is unknown how large it actually is. The Solar Boat Museum houses the most spectacular of all Egyptian boats found to date. Discovered in 1950, it was painstakingly reconstructed beginning in 1958 from 1224 individual pieces of cedar, acacia and other elements. Next your will tour the Egyptian Museum, located in Tahrir Square in Cairo. The museum was moved here from its second home in the Giza Palace of 'Ismail Pasha'. There are 107 halls with the collection in chronological order. The ground floor holds the huge statues while the upper floors house smaller statues, jewels Tutankhamon treasures and the mummies. There will be a break for lunch before returning to the cruise ship. It is important you are on time for tour departure as this tour is a part of a secure convoy of vehicles which depart the pier together. Remember to bring your camera. It is important you are on time for tour departure as this tour is a part of a secure convoy of vehicles which depart the pier together. The drive to Cairo is approximately three hours each way.